Countless business enterprises and service providers in the wind industry and logistics sector have set up business in the Federal Land of Bremen, creating a cluster of expertise that covers the entire supply chain. And because the promotion of offshore wind energy on the North Sea and Baltic plays a central role in achieving Germany’s changeover to green power, Bremen’s Senate is banking on increasing demand in this area. 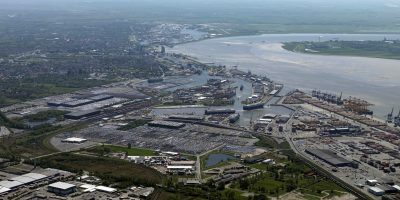 Bremen’s government has therefore planned the construction of the Offshore Terminal Bremerhaven (OTB) to consolidate and improve Bremen’s position as a port and industrial location in this comparatively new market. However, it is not yet clear when construction of the OTB can begin, as a legal dispute has temporarily called a halt to the project. The Federal Land and the port on the estuary have high hopes of the OTB, which will involve a 25-hectare loading zone for wind turbines on the banks of the Weser in the south of Bremerhaven. The port facility will be used for pre-assembly and transhipment of the turbines. The 500-metre long quay will have sufficient space for two to three offshore jack-up vessels. Bremerhaven already offers good location conditions and expansion options for the offshore wind energy: around 200 hectares of industrial sites are available for new business and expansions in the southern part of Fischereihafen. The planned offshore terminal will further enhance the port’s distinctive profile. Bremerhaven scores top marks for its capacity to handle ocean-going vessels, its efficient maritime infrastructure and its highly diverse business and research Cluster. Research, development, production, service and maintenance – both commercial businesses and research institutes in the wind energy sector have created a strong network on the banks of the Weser: well-known production companies, diverse suppliers and service providers join forces with excellent scientific infrastructure (Fraunhofer Institute for Wind Energy and Energy System Technology IWES, Wind Tunnel Centre, Institute of Wind Energy). This combination is unmatched anywhere in Europe. Up to 160 wind turbines per annum can be pre-assembled, stored and transhipped at the 25-hectare large terminal. The new Offshore Terminal in the south of Bremerhaven will have 2 to 3 berths and a terminal depth of 498 metres.